Ghulam Ali Sandilo Sindhi Singer. He is great Sindhi Classical Music Singer, he create great name in Sindh Music. He played a great role in popular Sindhi Cultural Music, Lok Music, Folk Music, and he is very popular on KTN Channel, Kashish Sindhi Channel and others all across the Sindh. He enriched the world of Sindhi Classical Music and enthralled the audiences with his masterful artistry in his fun of singing. His super hit Classical Music has been bringing solace to many hearts of peoples of Sindh. He is one of those rare Classical Musicians who expanded the peripheries of Classical Sindhi Songs by taking it to the common masses. 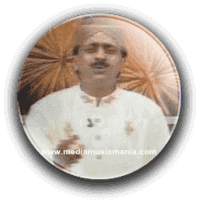 His rendering of "Sindhi Kaafis" was divine and used to enthrall and transfix listeners, and transport them into a different world. He played all "Sindhi Folk Songs" of great poetry of Hazrat Shah Abdul Latif Bhitai R.A, Hazrat Sachal Sermast R.A and other Sindhi Sufi Poets and other young poets of Sindh. Ghulam Ali Sandilo has sung in Marriage ceremonies, and other local Mehfils. I have selected below most popular Music of Ghulam Ali Sandilo. Ghulam Ali Sindilo belonging to Province of Sindh and he is most famous Artist. Sindhi Old Classical Music is the society convention which has created in Sindh over various centuries. Music from Sindh region is sung in Sindhi, and is generally performed in either the "Draws" or "Waee" styles. The Draws style is vocal music in Sanhoon "Low Voice" or Graham "High Voice". Waee instrumental music is performed in a variety of ways using a string instrument. Waee, generally called Kaafi, is found in the enveloping zones of Balochistan and Sindh.